4-3-3 soccer formation is one of the classic soccer formations that was first introduced in 1962 by the great Brazil side. It became very popular attack minded formation and many teams started adapting to it including the 1974 World Cup winners West Germany and two time finalists Argentina in 1974 and 1978. Soccer formation 4-3-3 has a very compact defense which consists of 4 defenders and one holding central midfielder helping defend making it a 5 player defense. Most attacks in 4-3-3 soccer formation will come from the sides by the overlapping outside backs (RB & LB) and the Outside Midfielders (RM & LM). There are 3 players in the forward positions looking to score so the center midfield player will have the freedom of staying back and holding the midfield. Soccer formation 4-3-3 will have four defenders spread out across the field. The two Center Backs should be tall, strong and very good in the air. Center Backs will need to be good at defending in 1v1 situations and their verbal communication needs to be at its best because they are the backbone of defense in this 4-3-3 soccer formation. Communication will ensure that all empty space is closed down by communicating with the players in front of them and telling each other where to go. Another important aspect of great communication in defense is for offside traps. With great verbal communication the team will move up in sync when the ball is played behind catching the attacking player in offside position. Center Backs can quickly convert into playing with a Sweeper role, meaning one CB playing 5 - 10 YDS/M behind the other CB and clearing all the balls that make its way behind. The Outside Backs (RB & LB) of 4-3-3 soccer formation are usually played by short and agile players that are very quick and have good ball handling skills. Outside Backs will need to be in exceptional conditioning shape because they will run deep into offense providing support to the attack by putting crosses inside the penalty area and than tracking back to defend when the ball possession changes. These players conditioning will depend on how well this formation is played. On every attack, Outside Backs (RB & LB) should run up and overlap the midfield players showing up for the ball and supporting the offense. 4-3-3 soccer formation midfield consists of only three players that are Center Midfield, Right Midfield and Left Midfield. 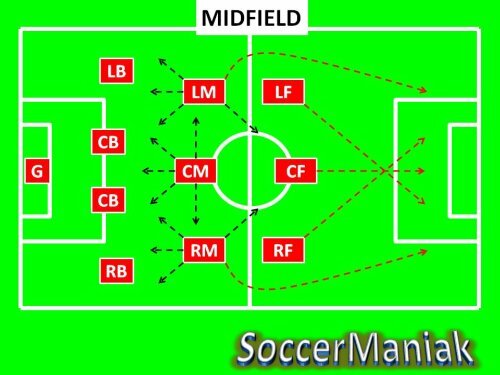 The Center Midfield (CM) will usually play a more defensive role or what is called a Holding Midfield Role that connects defense with offense. This player will have the responsibility of helping defense by stopping the opponent attacks in the midfield, and player in this position will be the starting point of attacks. Center Midfield strengths are good heading abilities and reading the game well. Calm passing and ball holding abilities are a must since this player will get many touches on the ball being the start of every attack. Right and Left Midfield (RM & LM) players are usually creative players with average defending and attacking skills. These players will need to have great ball holding abilities, precise passing with through balls and exceptional field vision to recognize teammate runs. Most important aspect for this 3 player midfield is to learn staying in their zone and not find themselves chasing the ball to the opposite side of the field leaving a hole behind them. The center midfield will hold the center of the field while the outside midfielders will want to come inside the field during attack making space for the Forwards on the wing and Outside Backs (RB & LB) to overlap them. Once the possession changes, outside midfielders will need to go back to their zone and defend. The attacking trio is very important for this 4-3-3 soccer formation to win games. It will consist of two wide forward players that are usually very quick and great at 1v1 situations against defenders. They will need great ball handling skills and crossing abilities. The wide players will open up space for the midfield by running wide and toward the sidelines or simply running inside and creating space for the Outside Backs (RB & LB) and Outside Midfielders (RM & LM) to come down the side. The Center Forward will usually be a tall player with great heading skills and clinical finishing. This player will usually be the top goalscorer on the team. Forward players will need to find themselves inside the penalty box on every cross and their job is to simply score goals any way possible. This 4-3-3 soccer formation is very effective against other systems that play with 3 or 4 defenders such as 4-4-2 formation or 3-4-3 soccer formation. Soccer formation 4-3-3 is weakest against formations with a high number of midfield players such as 3-5-2 soccer formation. The most important thing to learn when playing with 4-3-3 soccer formation is to have players move and not stay statically when attacking. Midfield will run inside, forwards will spread to the wings, outside backs will overlap midfield and come forward etc. When defending, this formation is best to defend with zone defense and the midfield cannot afford to chase after the ball. 4-4-2 Soccer Formation is the most popular system of playing by many clubs around the world. 3-5-2 Soccer Formation has a more attacking style of play, with the strength of the formation coming from the midfield. 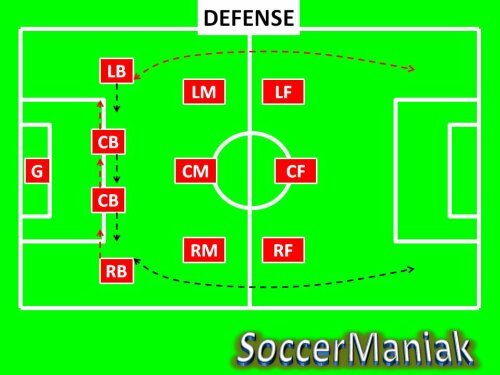 4-5-1 Soccer Formation is a defensive minded system of play and not that many teams use it as a starting formation in a match. 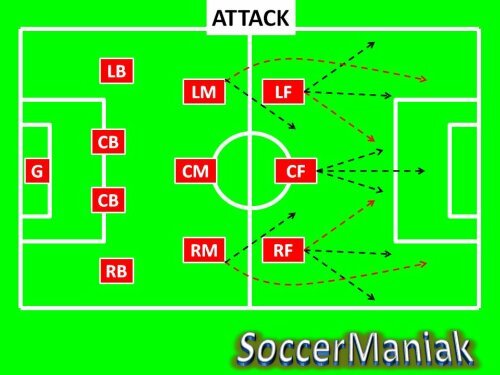 4-2-3-1 Soccer Formation is one of the emerging modern systems of play that provides a more attacking style but is also covered very well defensively. 3-4-3 Soccer Formation provides an offensive and attack minded system of play.